Gongju, Chungcheongnam-do, 16 May 2016, 2:15pm. Our first stop in Gongju is the set of seven or more tombs in Songsan-ri. The experts think there may be as many as ten tombs in the area. It seems odd, in an age when so much in the way of sophisticated electronics is available to archaeologists, that there are any mysteries left at all. But not everything can be investigated at once, and there are plenty of other Baekje-related archaeological sites that need research as well. As a tourist attraction these tombs don’t have the appeal of either the superbly located royal tombs of the Joseon dynasty, with their attendant statuary and shrines, or the huge Silla tombs you find in Gyeongju’s tumuli park. These are much humbler efforts: not much more than large pimples on the side of a hill, and quite closely packed together – a quite different burial practice from Silla or the later Joseon dynasty. You can see the tombs’ small arched entrance doors at the end of short tunnels, but you can’t go in. This is understandable, because particularly the 6th tomb is known for its wall paintings which, though rudimentary, are important and easily damaged. You wander up the hill, enjoying the views, taking in the smell of the pine trees. The mounds with their entrance doors make you think you could be walking around part of Tolkien’s Shire, but without the Hobbits and without the golden tinge to the lens. Instead, there are ajummas trimming the grass with hand-held blades. It’s a very pleasant, peaceful little park. At the bottom of the hill is an extra-large mound. This contains the local museum, which has some interesting exhibits and full-size reconstructions of some of the tombs on the hill that you cannot enter. I’m not sure what I was expecting. Maybe my mindset had been conditioned by watching too many Indiana Jones movies. But these are not spacious tombstombs – generous enough for a coffin, but not quite enough for two coffins end-to-end. According to the UNESCO submission, the first five tombs are constructed of stones and are square-ish in shape, with domed roofs. The 6th tomb is different, and the reconstruction of this tomb is one of the main exhibits in the museum. You have to bend double, almost onto your hands and knees, to enter it down the narrow tunnel. Once inside you can stand up straight, and are in a chamber maybe 4 metres long by 2.5 wide. 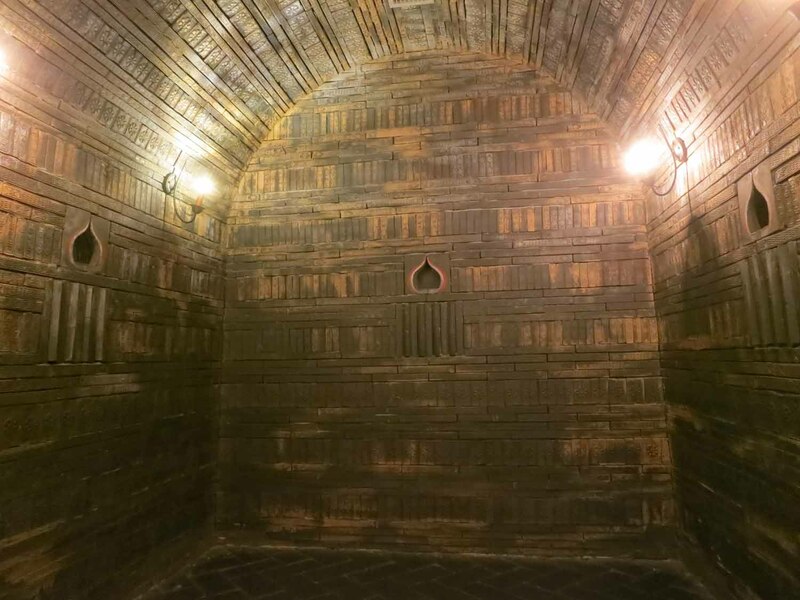 The shape of the chamber itself is also like a tunnel: vertical walls with an arched roof. What is interesting about the 6th tomb is that it is lined with geometrically-moulded bricks with lotus flower ornamentation, signifying a Buddhist influence. On the bricks are the remains of wall-paintings of the creatures signifying the four directions (the blue dragon (청룡) of the East, Vermillion bird (주작) of the South, White tiger (백호) of the West and black turtle (현무) of the North. The brick walls were partially plastered and then the animals painted with whitewash. The finer details of the animals’ features are rather difficult to see in the reconstruction. One assumes the paintings were more lifelike back in the early 6th century. The seventh tomb in the set was discovered by accident as recently as 1971 when putting in some drainage pipes to protect the fifth and sixth tombs. Given the location of the tombs on the side of a hill, it seems strange that there should be any risk of flooding, but these tombs are precious and need all the protection they can get. The first six tombs had been researched in the Japanese colonial period. It is not too much of an exaggeration to say that the discovery of the 7th tomb was earth-shattering. It had laid more or less undisturbed since its occupants were laid to rest there. The occupants were King Muryeong (r 501-523) and his wife. 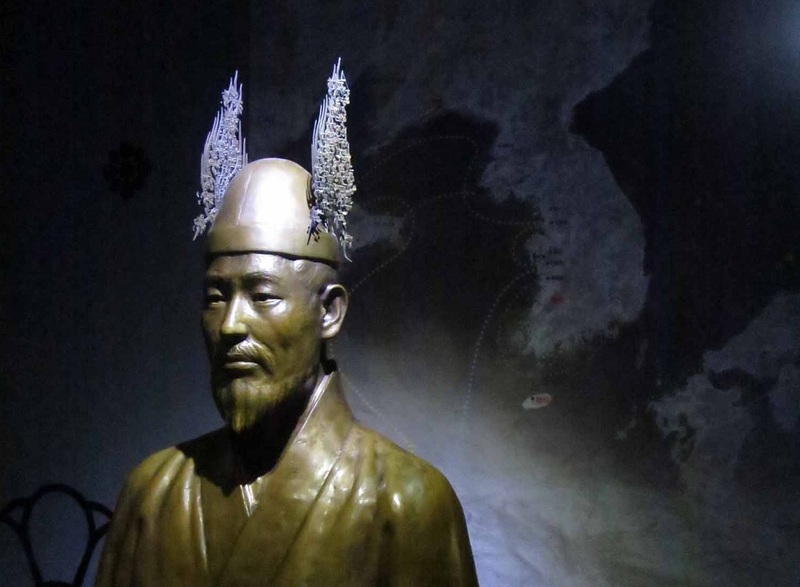 Muryeong consolidated Baekje power during the Ungjin period, giving the kingdom the stability to move its capital to the economically and geographically more advantageous site closer to the coast in Sabi (Buyeo) during the reign of his son, King Seong. He had opened up relations with Liang China, sending two missions in 512 and 521 – during the second of which he proudly announced his victories over Goguryeo. The coffin made of Japanese wood and the tomb guardian beasts and pottery from China were found inside the tomb… Also, there were glass beads made of lead originated from Thailand. 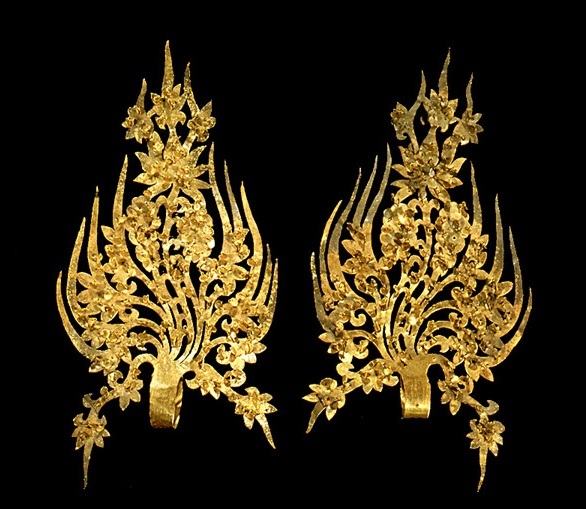 Flower ornaments for the diadem of the queen are the same patterns with the railings of the Great Stupa in India. Twelve of the items have been designated National Treasures (#154-165) and are now displayed in the Gongju National Museum: a stone guardian pig-like animal from China, around half a metre long, that was found on the floor in between the two coffins – the earliest example of such a thing on the peninsula; intricate golden ornaments that decorated the king’s and queen’s crowns; his and hers gold ear-rings over 8cm long; necklaces, bracelets, a hairpin and bronze mirrors to help the deceased do their makeup in the afterlife; a headrest and a footrest; and most helpful of all: two engraved stone tablets which documented who was buried there and when the tomb was built. The museum takes us about 15 minutes to look around, and then we make our way to the fortress – the defensible piece of ground which made Gongju such an ideal spot after the fall of Baekje’s capital on the south of modern Seoul’s Han River.